American Property Loss NC Public Adjusters are available to do a complete review of your NC ice damage insurance claims. Our local North Carolina Public Adjusters can do everything from initial on-site ice damage property estimates or reviewing your insurance company adjuster estimates for completeness to completely handling the ice damage claim from start to finish for you. American Property Loss North Carolina Public Adjusters are experienced and ready to get your life back in order after ice damage. While ice can look real pretty at times, it doesn’t look pretty when it start building up on your property. From snapping tree limbs as in our picture to causing major damage to your roof, gutters and eaves, ice can be a very powerful force. Sleet and freezing rain can create ice buildup very quickly on trees, houses, power lines and practically everything it touches. A thin layer might look pretty, but it doesn’t take much to bring on serious problems. An ice accumulation of just a quarter inch can add as much as 500 pounds to the average power line span. When this same freezing rain accumulates on your trees, the weight can go well into tons and cause limbs to completely break off from trees. These limbs can come down weighing hundreds of pounds depending on size and possibly onto your house, car, fences, other outside buildings as well as utility lines. Average limbs without the added weight of ice can cause enough problem – say nothing about that added weight crashing down. It is common to see damaged vehicles, damaged homes and buildings after these types of storms. While causing physical damage is bad enough, very frequently, power outages also occur during these types of ice storms. With power outages come spoiled food, lack of heat and other essentials. Lodging with power is frequently sought while waiting for power to be restored. In extreme cases, power line repair can take days or even weeks depending on the area and actual damage. During snowy North Carolina winters in the mountains, it is common for a few icicles to be seen on a roof. This can get extreme though in some cases. Icicles are the result of water runoff not draining properly from a roof. Under normal circumstances, melted water should run off a roof or through gutters and downspouts to clear the roof. When situations such as ice damming (spouts getting blocked to prevent water drainage), larger numbers of icicles may be found “dripping” off your roof. 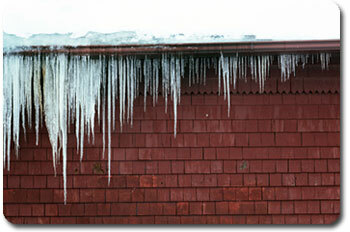 These icicles can become a large problem by causing water to push back under the roofing and getting into the home. Additionally, large icicles can become large enough to cause true physical damage to a roof or gutter that was never meant to have large amounts of weight hanging off the edge. Gutters and more can be ripped right off the house as a result of large ice buildups. What North Carolina ice damage will your insurance cover? Homeowners insurance usually does NOT cover damage to your trees, nor will it pay for removal of fallen trees and limbs. Temporary Housing is usually covered if the house is damaged badly. If a tree has fallen through your roof into your living room, you will likely be covered. If the house is not damaged badly, as in a small amount of roof damage, then temporary housing will not be covered. Water pipes bursting due to no power or heat are usually covered as well as any damages that it may cause to your home or contents. While usually minor, your homeowners insurance policy will usually also cover spoiled food resulting from a power outage. Temporary or alternate housing if the issue is on your property is usually covered if the problem is very local – a line perhaps directly on your property has snapped. If it is a power outage on a larger basis – your neighborhood for example or a whole town or county area – then alternate living arrangements are usually NOT covered. Either way, if you must go elsewhere due to power outage at your home, keep your receipts and share them with one of our Illinois Public Adjusters and with the insurance company claims adjuster. The expense may be paid at the discretion of the company and you may just be reimbursed. Review your policy to make sure you understand what ice damage losses are covered and what losses are excluded by your policy. If you’re not sure, ask your agent or an insurance company representative for an explanation. Your insurance company must start investigating your claim within 15 days after receiving written notice. If you have an active water leak – such as a plumbing leak from a frozen pipe – the company will probably verify that you have shut off the water and have called someone to repair the leak. While the insurance company can assist you by providing a list of qualified specialists, you may select a plumber or contractor of your choice and are not required to choose someone from the company list. Your insurance company will send a company representative or claim adjuster to your home to see the damage. If your damage was caused by a natural disaster or similar catastrophic event, it may be a while before the area is deemed safe and a claims adjuster is able to see your home. When the insurance claims adjuster inspects your home, it’s a good idea for you or a family member to be there to make sure the insurance claim adjuster knows about and inspects all flood damaged property, and to provide information or answer questions.